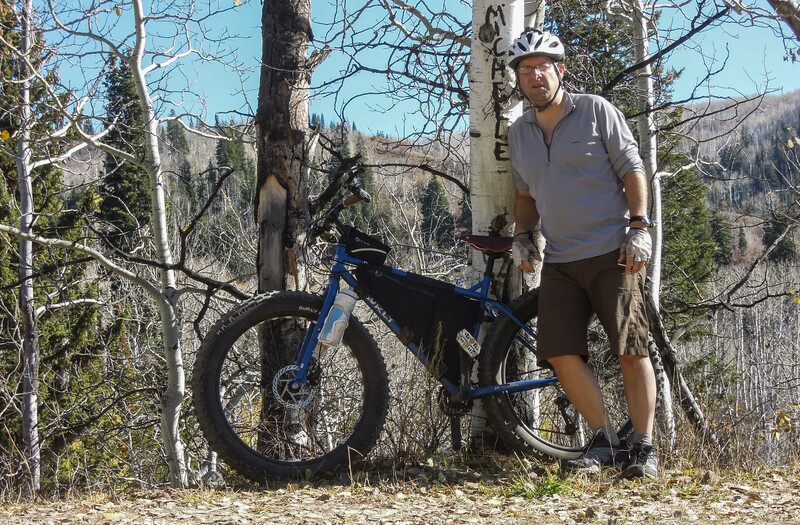 I’ve run up Hobble Creek left fork, and I’ve skied up it in winter, but I had never ridden up on a bike. It has warmed up here in Utah Valley the past week, and the daytime temperatures have been in the 60’s. The leaves are still turning and it is a beautiful time to be in the mountains. We are fortunate to have the mountains so close to the city. 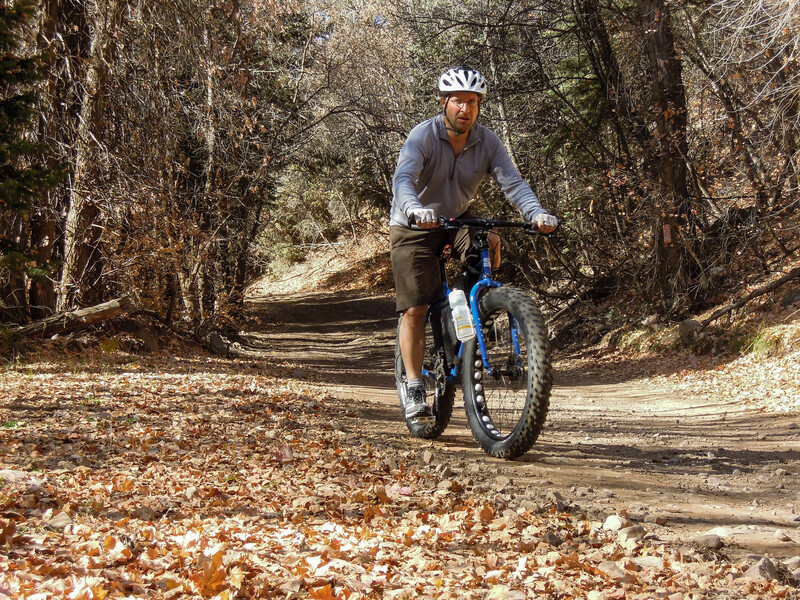 You can drive 20 minutes and be up a beautiful canyon with dozens of trails. 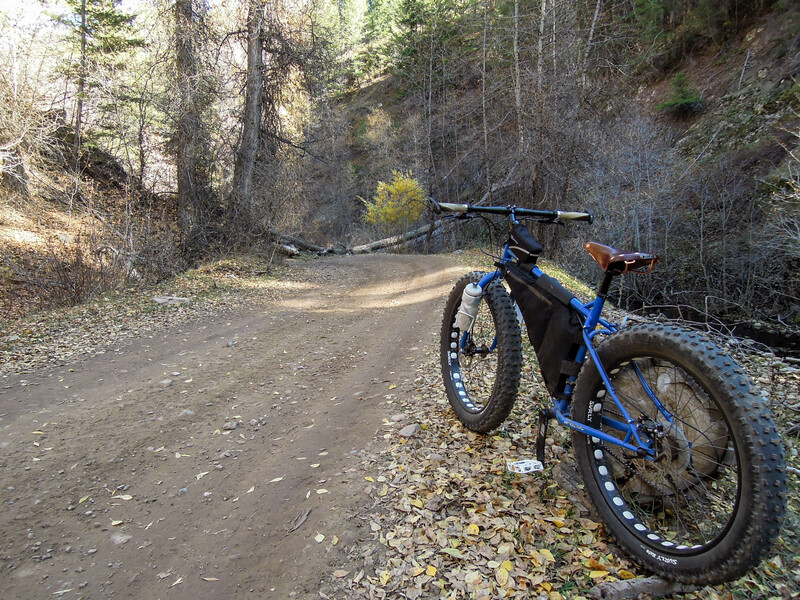 I parked at the end of the paved road up Hobble Creek Left Fork Rd. 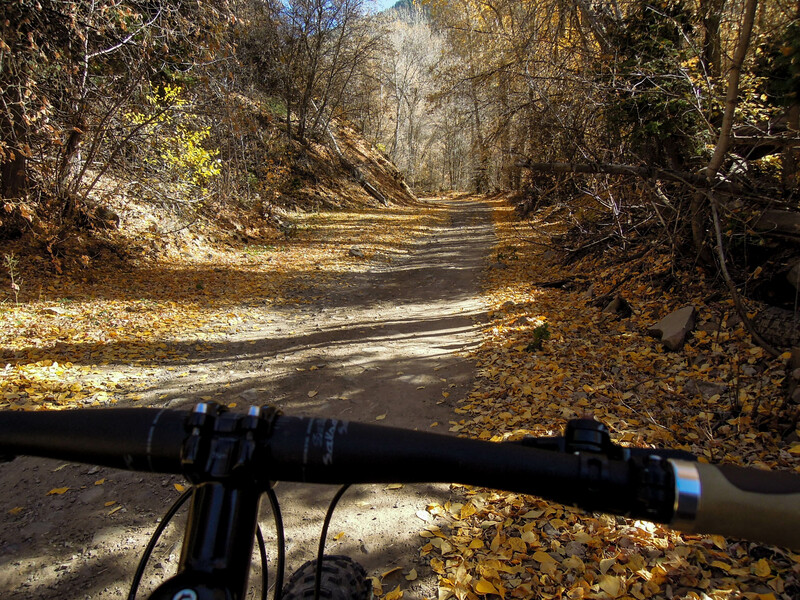 and began riding up the dirt road. 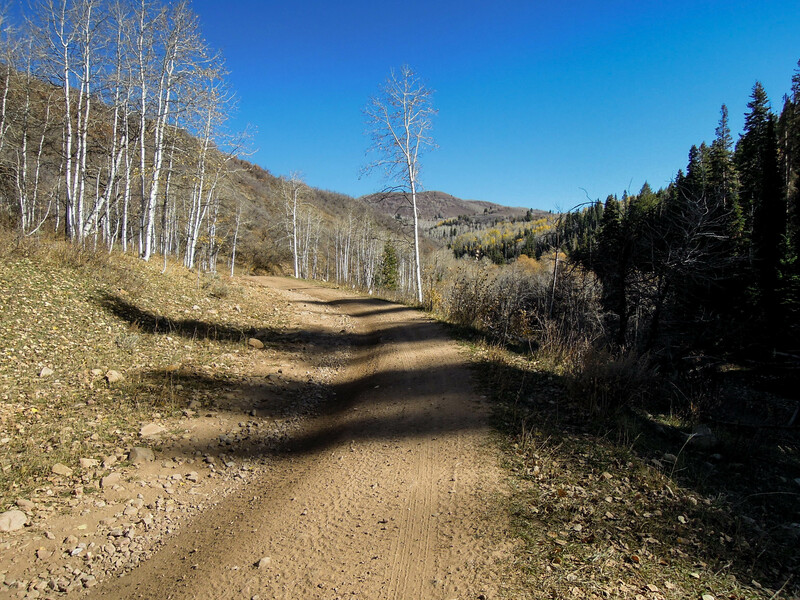 This is not spectacular mountain biking terrain as it is just a dirt road. Most of the traffic this time of year is ATV’s, and most of them are hunters. I had actually only been about 5 miles up the road. At the four mile point there is a turn off that goes up Rattlesnake Canyon. There is an aid station here for the Squaw Peak 50 Mile Trail Run. Since I have run that race, I was familiar with this part of the road. I had skied beyond this point a mile or two in Winter but that’s about it. I was in the mood to explore and wanted to see what things were like higher up the canyon. From studying maps I knew that this road branched about 8 miles up the canyon. 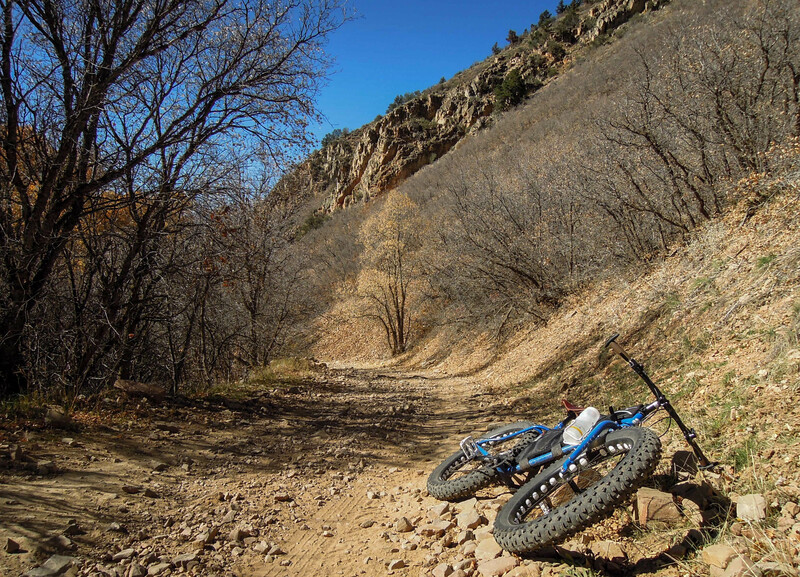 One fork curves back around into Diamond Fork Canyon, and the other goes all the way to Daniel’s Summit, quite close to Strawberry Reservoir. According to mapmyride, it is 16 miles to Daniel’s Summit. Too far for today, but I did want to get up as high as I could with the time that I had. My weapon of choice—the Surly Pugley. I first told myself I would turn around after an hour and half. 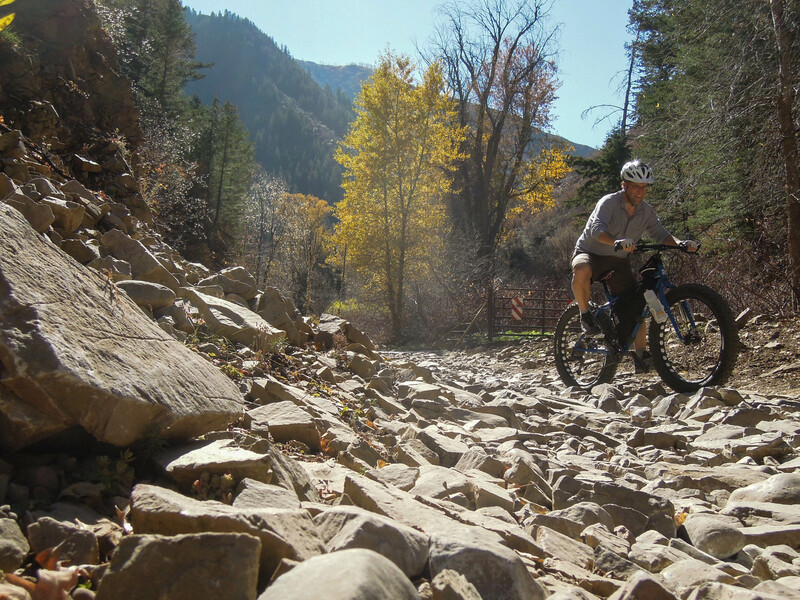 A mile or so into the ride there is a creek crossing (see photo above). Nothing big, just about 20 feet across and maybe 4-5″ deep. Still fun splashing through the water, especially on the way back when I was going much faster. There are a few sections of this road that are quite rocky and some sections that are pretty steep, probably 8% grade or so. But everything is ridable and for the most part, the road rising pretty gradually, but climbs the whole time. Down lower the maples were brilliant yellow, but higher up the aspens were mostly leafless leaving a nice yellow carpet to ride on. After an hour and a half, I told myself I would turn around at two hours since I would be descending much faster than climbing. A couple miles into the ride. A very rocky part of the road. 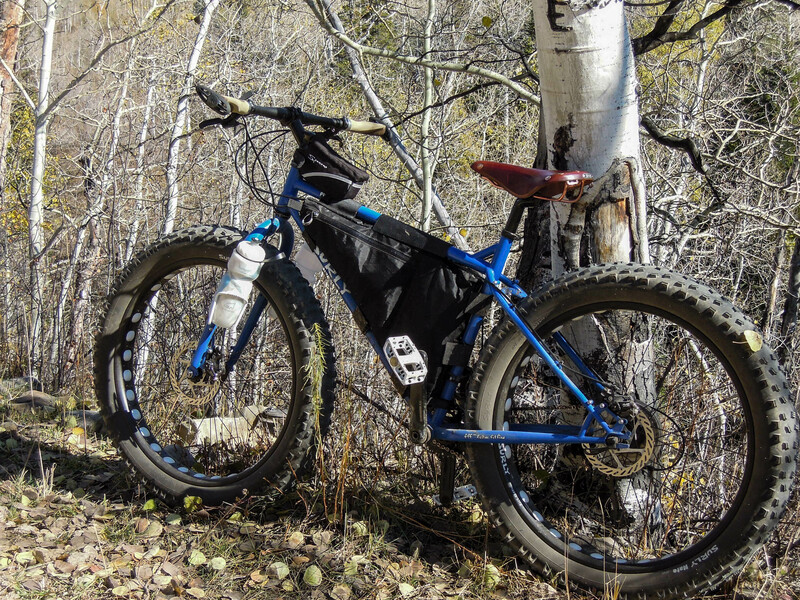 Fat tires roll over this kind of stuff with ease. Yellow was the color of the day. Some parts of the road were nicely wooded and shady. 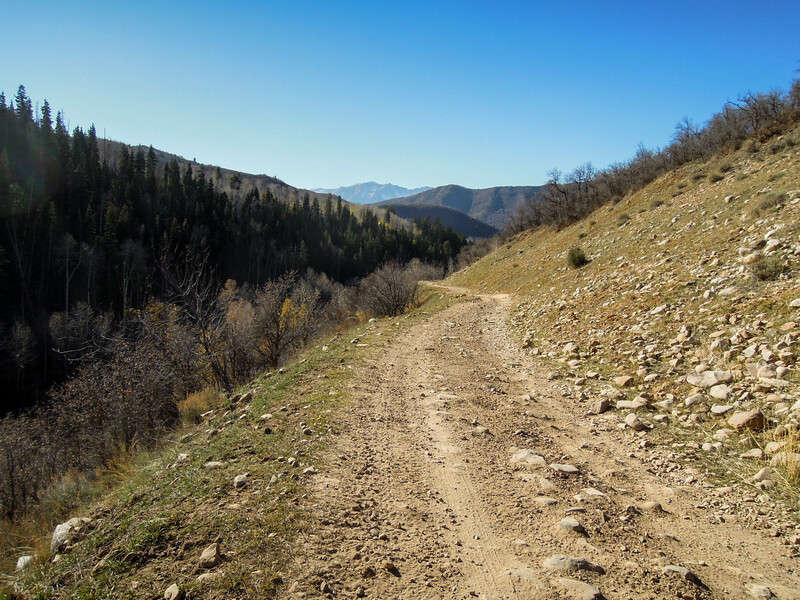 The road parallels the left fork of Hobble Creek almost the whole way. One of the smoother sections of the road, about 6 miles up. At two hours, I felt like I was getting pretty close to the junction, so I told myself, two hours and fifteen minutes, then I’ll really turn around. I was getting tired. At 2:20 I hit the junction, 8 miles up the canyon with 2238 feet of climbing. 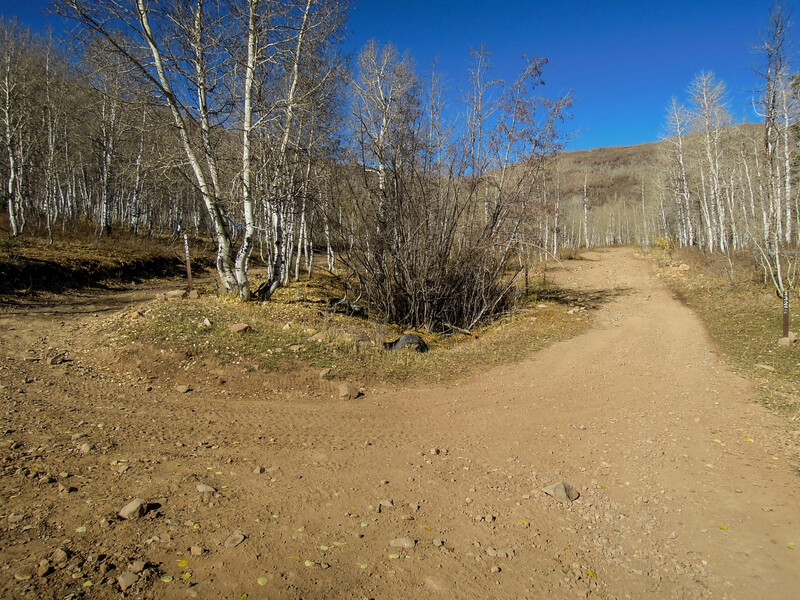 The right fork is route #132 and loops back toward Diamond Fork, and the left fork is route #619 that heads toward Daniel’s Summit. I was ready to turn around. About 7 miles up the canyon. I was a little concerned that the ride down would be really bumpy and rough. So I let some air out of my tires, probably to around 6 psi. That did the trick and the descent was fast and quite enjoyable. There were some rough, bumpy areas but it was not nearly as bad as I thought it would be. The descent only took 39 minutes and I hardly had to peddle that whole time. The junction, 8 miles up the road. Heading down through a rocky section. It was a pretty enjoyable ride. The weather was pleasant, the leaves were in full “bloom” and it’s always nice to be out in the mountains. The whole ride took 3:05. 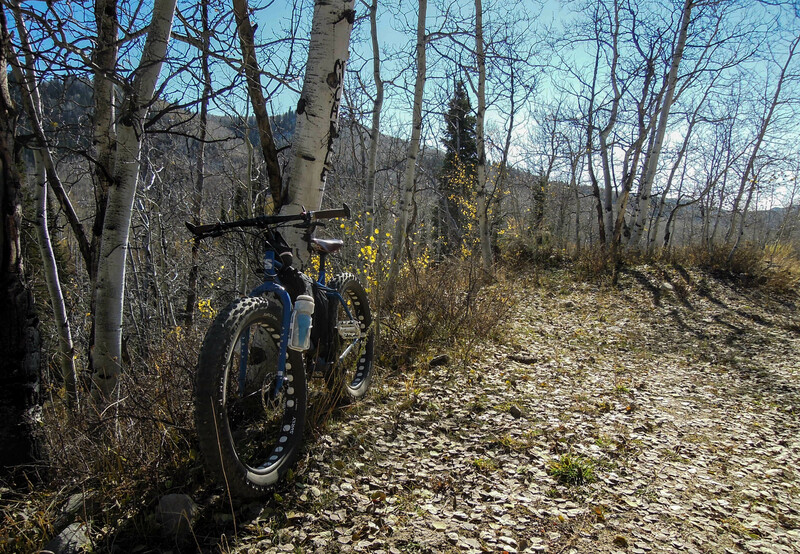 Someday I would like to start from Daniel’s Summit and ride down to Hobble Creek. There would be less climbing and more downhill doing it that way. I think it would be a nice ride. 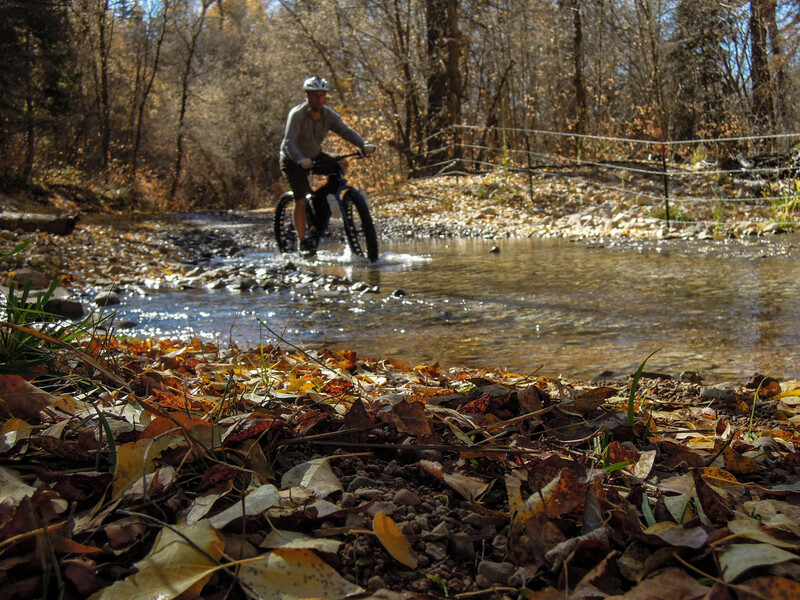 I love the Creek Crossing photo!